Just saw this poster at IMDb. Since I haven't read the books, and never saw this crown in the show, is this some sort of inadvertent spoiler? Is this a famous crown of some sort, that is talked-of in later books, or is it just a random crown? 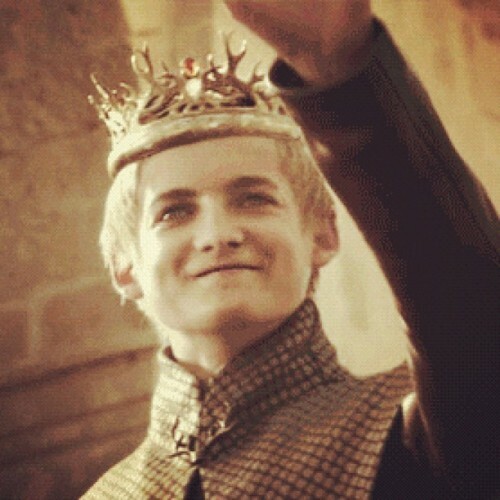 It doesn't look like the one Joffrey wears, which has a stag horn design. This new one looks dragony. Any info? Spoilers are ok, just mark them if necessary. Also, the poster mentions five kings. All I can remember are Joffrey, Robb Stark and Stannis Baratheon. Who are the other two? Daenerys wants to be a queen, I should think. Well, if they want to specify "kings", I suppose you could say they're talking about Viserys. But, since he's not so relevant by the time of the second book (which is called A Clash of Kings), I think the gender specificity isn't meant to be important. I think they're referring to Daenerys. And the fifth one is Renly. Danerys isn't included in the count because it's called "The War of Five Kings" and Danerys a.) has no army and b.) isn't on the continent. (Forgive my misspelling of her name). Although, yes, Balon doesn't declare himself a king until after Renly is dead - so it's not "War of the Five Kings all at once." Of course, you've also got Mace Ryder in the north, but no one south of the Wall is really aware of what he's been up to. Right. Still a bit pissed that they didn't show Mance Rayder in the end of the season 2 cliffhanger, intimidating Jon Snow. With the exception of Balon, every new senior character revealed has always been played by some cool vintage actor I used to see in the 80's/90's (especially James Cosmo), so I'm really hoping Mace will be played by some hard case. As I understand it he's not been cast yet. I hope they choose some psycho. I take it no one has heard of any named crowns in the books, then? This new one looks so special, like it has properties or something. I don't know about it having properties... keep in mind magic has been gone from Westeros for centuries until now, IIRC. Like sleeping in fire? Birthing a shadow clone? Being in ten places at once? That kind of magic? All three of those tricks seem to've been practiced for a long time by their wielders, by the way. I don't know anything about this crown, for all I know it could be newly minted in later books than the show has caught up to, that's why I asked here. I was under the impression that the return of magic was supposed to be tied to the return of dragons. (Bear in mind that I've only read the first three books.) I don't recall anyone doing anything magical until then. Unless Daenerys showed that she was fireproof before that? I think she did in the show, but I don't remember it in the book. Melisandre doesn't start squirting out shadow assassins until the second book, and I don't recall any indication that she had done it before that (or, to be fair, that she hadn't). And I'm not sure what you're referring to with the "ten places at once" thing. Come to think of it, though, I suppose the Others and their zombie minions might be considered magical in some way. I think you're about magic being tied to the life of dragons somehow. No, I know she didn't show up until book 2. I just meant that I don't recall anyone saying that she was known to have done any magic in her life prior to that. The warlock Pyat Pree of Qarth displays supernatural talents and abilities, among them telepresence, illusion and conjuration. While the show may have taken liberties with certain characters' point of introduction and other details, Pree seems a very old and very well-trained man, who must've learnt his trade from some secret order or tribe who are talented in magic. Maester Luwin specifically mentioned that he studied magic and was unable to use it, same as every other maester that has tried for centuries. But, things seem to be changing and I get the impression that magic and/or dragons are going to be the only way to defeat the White Walkers. I guess, now that I think about it, Khal Drogo's being brought back to "life" clearly involved some form of magic, and that obviously happened before the dragons were hatched. Maybe you're right, and the absence of magic was strictly limited to the continent of Westeros, for some reason. Simple. They had so much fun with it (!) back in the day that Westeros has been on cooldown since then.